Find out how you can get back to the life you want to live! Download our 5 Step Guide! Here at Aushealth Physiotherapy we take an holistic approach to back pain to ensure we determine the precise cause of your back pain and don’t just treat the symptoms. Back pain is the most common injury we treat at Aushealth Physiotherapy and we pride ourselves on our proven track of getting the very best outcomes for all our patients. We understand that your back is not the same as every other back and because of that, we take time to conduct a thorough assessment and to develop an individualised treatment plan for you. We will help you correct your spinal alignment and ease muscle tension and pain to ensure your back is not at risk of further damage. We know that back pain can impact on many aspects of your life, including your work, sport or leisure time and sometimes even your sleep! We can offer you advice on all of these situations to ensure you return to your best as quickly as possible and you avoid re-injury. To stop back pain impacting on your life, call Aushealth Physiotherapy for an appointment with one of our expert therapists today. The Physiotherapists at Aushealth Physiotherapy service Brookvale, Freshwater and the surrounding suburbs for the condition of back pain. 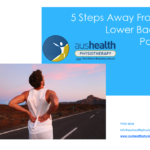 We have a fantastic 5 Steps away from Back Pain Guide that you can download HERE.